Kindle loves this project because... their Solutions Lab idea to transform the current community forest in Santa Fe into an ecologically resilient one by empowering local groups and leaders to take action, engage in collaborative education, and share knowledge is inspirational. Their desire to shift and adapt the physical environment to respond to climate change is infused with their unique way of brining about more ecological consciousness in the community. We're so looking forward to seeing their Solutions Lab idea take root. We asked the Railyard Stewards to imagine it’s the year 2050. We wanted to know how their work contributed to positive change on the planet 36 years from now. Thirty-six years ago, the City of Santa Fe was in a terrible drought. The escalation of Climate Change in the region dried up water resources significantly, which in turn plagued the city and surrounding farm land with no irrigation. The southwest region of the United States was on the verge of being uninhabited, though the symbol of grassroots democracy in Santa Fe prevailed. 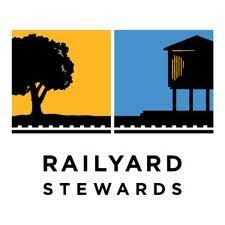 The Railyard Stewards (Stewards), a non-profit organization based in Santa Fe, took the lead and inspired the community. All corners of Santa Fe emerged, gardeners, plant nursery owners, local businesses, city personnel, state officials, and youth to elevate their environmental consciousness and encompass a connection to an urban forest. The Stewards built the visionary urban forest model using the Railyard Park + Plaza as their tool to motivate, encourage, and inspire the citizens of Santa Fe. Led by young people, the city of Santa Fe began to take back its natural landscape, and create a sustainable urban forest composed of drought tolerant and fruit baring trees thrat were cared for by the community. Partnering with the Stewards, the plant nurseries served as hubs for Santa Fe citizens to purchase trees that would grow well in a high desert environment and that did not use much water. The youth, activists, gardeners, local business owners, and concerned citizens carried out a successful guerilla gardening campaign to take out invasive species such as the Siberian elm tree and replace them with native Cottonwoods, Burr Oak and Crabapple trees. Santa Fe’s urban forest slowly grew and created new habitat for birds and critters, increased shaded areas and reduced water use. City personnel assisted community member to better understand which trees were best for removal and the best choices for replacements. State officials leveraged their influence to increase city budgets and tax breaks for businesses that took an active position on the urban forest development in Santa Fe and across the state. Plant nurseries and garden centers filled their inventory with species of plants and trees that would help Santa Fe conserve water. Master gardeners, local horticulturalists, public school and college environmental groups, everyday people, and children replanted the tree population which still stands today. The coalition is a testament of true grassroots democratic power shifting society to act for the benefit of everyone. From Santa Fe, the urban forest initiative spread resembling a wildfire across the state. In Northern New Mexico, Francis Castillo y Mulert, a young leader, partnered with the Stewards during the Kindle Solutions Lab to work on eradicating Siberian elm trees from the landscape. With his energy, drive, and the skills he learned from the Stewards, Francis ignited a grassroots movement to free the water ways from the clutches of Siberian elms led by the youth of small towns in Northern New Mexico from Truchas to Española and down to Santa Fe. Today, the creeks and rivers that stretch along the rural landscape of New Mexico, are no longer encumbered with the drain of non-native plants, sucking them dry. Natural vegetation grows without competing with invasive species. Along the Rio Grande River, which flows through New Mexico from Colorado and down through Texas, communities heard about Santa Fe’s initiative to build an urban forest and joined the movement to support urban forestry and eradicate invasive, water intensive species. Community groups formed and cut down salt cedar in riparian areas and replaced with willows which thrive along the river today! The Rio Grande River has returned to its historic flows and reaches the Gulf of Mexico, as it did two centuries ago. The drought that once plagued one of the largest rivers in the United States ceases to exist. The Urban Forest Initiative became a model for community action against environmental degradation. In the years to come, cities and communities across the United States, Mexico, Canada, Central and South America began to initiate urban forestry programs as a means to support the over burdened ecosystems across the globe.Water levels rose, natural vegetation grew back; ecological restoration inspired two continents to act in the interests of future generations. An early member of the Urban Forest Initiative and former Program Director for the Railyard Stewards, Marc Grignon, looks into the past and has an insightful perspective. Join the “I’ve planted a tree campaign,” and ensure the prosperity of future generations.